Launched in the UK in 2005, the Accent™ radiofrequency (RF) machine distributed in the UK by Advanced Beauty Cosmetic Ltd is the only RF system of its kind currently available in the marketplace. This is because the Accent™ system boasts dual handpieces – a bipolar handpiece for volumetric dermal heating, aimed primarily at skin tightening treatments; and a Unipolar (or 3rd generation Monopolar) one for a deep controlled penetration depth of the RF energy for fat reduction and cellulite treatment. The Accent™ provides controlled radiofrequency energy using unipolar and bipolar handpieces, for deep (up to 20mm) and superficial (2 - 6mm) penetration of RF energy, respectively. fatty acid decomposition and heat-induced fat cell death. Unlike other monopolar devices, such as the ThermaCool™ from Thermage device, the Accent™ does not require additional costly consumables (which often get factored into the cost of treatment) such as a coupling gel, return electrode (or grounding pad), or single-use treatment tips. The Accent™ also does not require very good contact or pressure in the treatment area as it is used in motion; (known as a RF in motion technique), where the hand piece is moved in a vertical and horizontal pattern over the area rather than just staying in one spot at one time). The bipolar handpiece penetrates less deeply into the tissue for use in facial tightening procedures in areas such as the temples, where the controlled heating at the desired penetration depth is essential, and deep penetration is avoided due to the sensitive nature of the area. 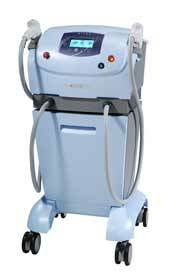 By applying the RF Bipolar energy at a higher radiofrequency of 40MHz (compared to 6MHz with ThermaCool™ from Thermage or 1MHz with Elos™ devices from Syneron), the Accent™ promotes controlled and pain free (for most people) heating of the skin in the treatment area, with subsequent contraction of the collagen tissue and a tightening of the skin. Before the treatment, an anaesthetic cream may be applied to the skin depending on your personal tolerance and sensitivity to pain. Although, most people find that the treatment produces a “comfortably warm” sensation. The area to be treated will be marked into grids with a special pencil and then lubricated with thin layer of oil, i.e. the treatment oil recommended by the manufacturer or a substitute such as Johnson’s baby oil. Then a reading on the skin surface temperature will be taken using a laser guided thermometer (supplied with the Accent ™ system) to assist the practitioner in assessing the heating effect that the RF energy is producing. Regular temperature checks will follow to ensure that the correct degree of heating is being obtained in the treatment area, and also to ensure that a uniform delivery of the RF energy is being maintained, based on a uniform skin surface temperature throughout treatment. Both RF energies are delivered to the skin’s surface with continuous contact cooling delivered by powerful cooled tips (TEC sapphire) which provides additional patient comfort and also protects the surface layers of the skin. Although, it is worth noting that the Accent™ is the only Unipolar and Bipolar RF system that actually allows practitioners to work with the cooling set to off (if desired); this is due to the way the controlled RF energy is delivered to the tissues, ensuring that the heating effect required for the desired results is only present in the sub-dermal layers whilst at the same time the skin surface temperature is kept at a “comfortably warm” level, (surface temperature reading within 39-42°C). After treatment, the oil will be gently removed from the skin surface and the area dried. No aftercare cooling is required but you may wish to moisturise the skin afterwards. You will then be able to go about your daily routine immediately afterwards. It was awarded a CE Mark in June 2005 for cellulite reduction, and FDA approval for the treatment of wrinkles in April 2007, with further approval for more applications currently pending . The Accent™ does not currently come under current Care Quality Commission legislation and can be used by a trained aesthetician with medical supervision. Results are said to last for anything from 6 months to up to 2 years for facial tightening treatments according to the manufacturer. However, ongoing maintenance will be required more frequently for older people and for those with poor skin quality to begin-with, as a result of smoking, sun exposure, alcohol consumption etc. For body contouring applications, the improvement in the skin quality is said to be long lasting, similar to the facial tightening results; however keeping the body contours in check is also subject to a person’s diet, calorie intake, exercise and lifestyle. Fat cells have the capability of expanding to 500 times their size, thus an unbalanced diet and unhealthy lifestyle plays a centre roll in keeping body contours in good shape more than any treatment can, effective as it is. A heating sensation or pain during the treatment or immediately post-treatment. This pain is expected to be mild, and should disappear within a few minutes. 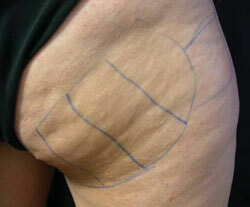 Mild erythema or reddening of the skin may appear in the treated area, which is likely to disappear within 24 hours. A feeling of dry skin may occur during the first 12 hours post-treatment. It usually disappears within 48 hours. Lubrication with aloe-vera can be helpful. In very rare circumstances and if the correct instructions are not followed by the practitioner, it is possible to suffer from a skin burn. As long as you are generally healthy and don’t have any skin diseases or infections in the area treated, there are few medical reasons why patients should not undergo this treatment. Although there is no evidence that this treatment is harmful for pregnant women, you would generally be advised to wait until after you have given birth before embarking upon a course of treatment. More importantly, people with electrical devices e.g., pacemakers, or metal implants e.g., artificial metal hip joints, heart valves or dental plates, cannot be treated because RF current flowing through the body may interfere with these devices or heat up metal implants, which could be dangerous. Also, until further studies have been carried out it is advisable not to have treatment in an area previously treated with dermal filler products, such as collagen. A treatment session can be expected to last about 25-40 minutes and are usually recommended once every 1 - 2 weeks with an average of 8 sessions in a body treatment programme. This may be followed by a maintenance session in 1 - 3 months time. 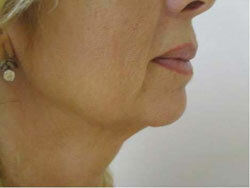 It is recommended to have a course of 4 sessions (once every 3 - 4 weeks) for facial tightening. Private costs for Accent™ body contouring and cellulite treatments depend on the area(s) being treated and can start from approximately £100 - £300 per body area per session. Discounts often apply for a course of sessions. Private costs for Accent™ facial and neck treatment session costs from £350 - £700 depending on the treatment area and the condition of skin. 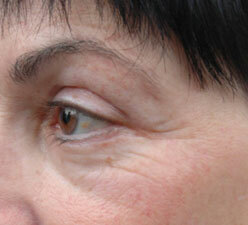 2 weeks after 4th treatment with Accent™ on crow`s feet around the eyes. Images provided courtesy of Advanced Beauty Cosmetics Ltd.
Joseph Lepselter Ph.D. and Yaron Assaf, M.D. Radiofrequency: A Real non-Surgical Face-Lift? Click for ALL Accent ™ clinics in the UK & Ireland registered and verified by Consulting Room. 4 out of 5 based on 1 customer reviews. 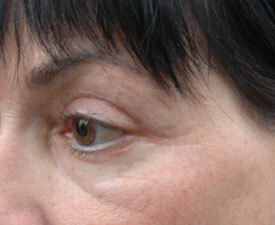 Unlike dermal fillers, threads create a lifting effect, whilst stimulating collagen at the same time. But this is not the only ingredient for Threads of Life - I also team the PDO Threads with PRP for its healing properties.